I have very much come to think that the title of this blog could well be a good marketing slogan for the Queensland State government. Brisbane has also regularly lived up to the old slogan of “beautiful one day, perfect the next”! 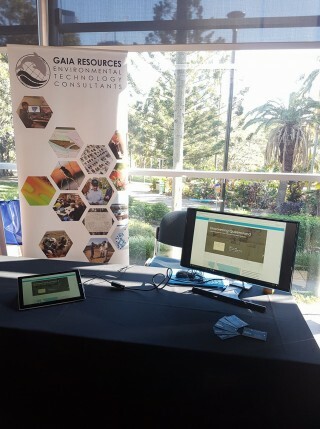 Last week I went to Brisbane to attend the Testing Within Government (TWiG) showcase event, where I was there to help showcase our work with the Discovering Queensland project (see our old blog here, and a new one is coming! ), as well as to provide support to the team from Queensland State Archives (QSA). The TWiG showcase event was very worthwhile. 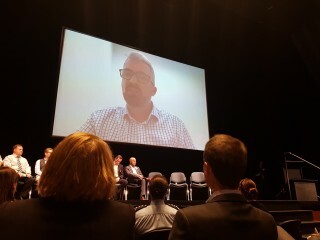 Our Discovering Queensland project was presented by Andrew Patch from QSA giving a live presentation, around Morgan giving a video presentation “live from Fiji” – he was on a well deserved, and long-ago booked, holiday. Both Andrew and Morgan did a great job in setting this up and it ran very smoothly and seamlessly! After the presentations (and before as well) we also presented our project at a trade-show style booth. I opted for a minimalist approach to let the Discovering Queensland project speak for itself, just showcasing the site on a tablet and mobile device. You can actually see the site via this link if you are interested, and as mentioned, we’ll blog more about that project later on (once Morgan is back “from Fiji”). It was a strong show of support to have the Queensland Minister for Innovation, Leeanne Enoch MP, come around and discuss all the projects, along with representatives from a range of other government agencies and other businesses. You might have seen a post on the Minister’s Facebook page about the event with us in it! The whole room had an energy, and a “can do” attitude that was really refreshing. In operating Gaia Resources for 14 years, primarily in Western Australia, I’ve never attended anything like the TWiG initiative that has such a strong focus on supporting small businesses. It certainly is a sign of how seriously Queensland takes the small business sector, and puts their efforts, resources – and funding – into making it a reality. 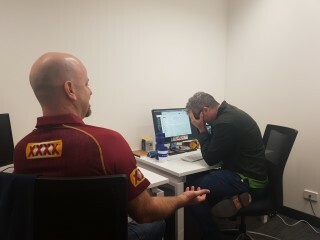 While I did buy my Maroons jumper just to prank Morgan (who’s a staunch New South Welshman – see below), I think I’m becoming a Queenslander.